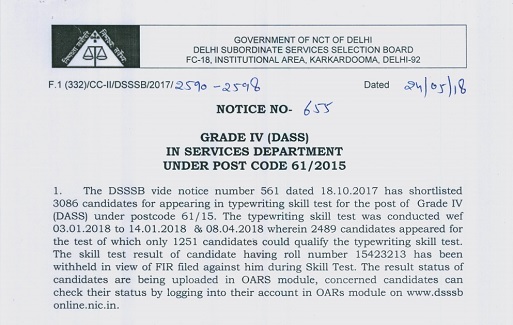 Delhi Subordinate Services Selection Board (DSSSB) has published the result of typewriting test for the post of Grade IV DASS (Postcode 61/2015). The test was conducted from 03-Jan-2018 to 14-Jan-2018 & 08-April-2018. Based on the performance in typewriting skill test 1251 candidates who have qualified the typewriting skill test are provisionally allowed to upload e-dossier subject to correctness of the information furnished by the candidates in their online application forms. The roll numbers of the candidates who have qualified the skill test are available in the PDF File.